Yesterday the U.K. GDP report provided volatility for the pound pairs when it showed a 0.8% growth for Q1 2014. This is an improvement from Q4 2013’s 0.7% uptick but still a bit behind analyst estimates of a 0.9% increase. Compared with Q1 2013 the country’s economic output had grown by 3.1%, its fastest pace since Q4 2007 and is just 0.6% below its 2008 peak. And to think that just a year ago we were worried that the U.K. would experience a triple dip recession! A closer look at the report reveals that it was the services sector (which makes up almost four-fifths of the economy) that pulled the overall GDP higher with a 0.9% increase. Manufacturing output also grew by 1.3% while construction output inched 0.3% higher. Market players think that the latest U.K. GDP is in a “Goldilocks” scenario wherein it’s not too hot and not too cold. In other words, it’s good but not good enough to warrant any policy adjustments. Remember that the Bank of England (BOE) already has room to keep its current policies steady. The inflation report dropped to 1.6% last month, its lowest rate in more than four years. In addition, a report released by the Office for National Statistics (ONS) showed weekly earnings catching up to inflation for the first time in SIX years. Talk about perfect conditions! With the U.K. GDP figures warranting neither stimulus nor tightening, the BOE even has less motivation to act. 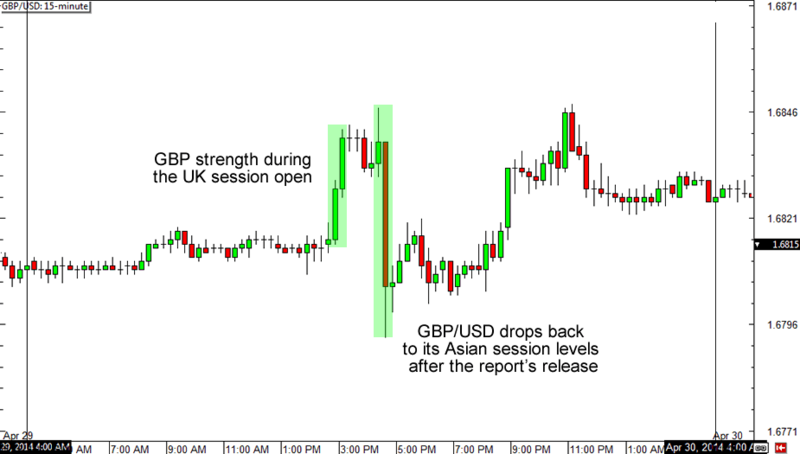 This is probably why pound pairs had quickly erased their intraday gains. GBP/USD in particular rose by 30 pips at the start of the London session but wiped out all of it when the report missed the expected 0.9% mark. It even tried for another run for its intraday highs before ending the day just above its Asian session levels. Speculations for a BOE rate hike doesn’t end here though. After all, growth is still growth. It probably won’t be long before some other positive U.K. report refuels talks of tightening. The question is, how long can the BOE hold on to its stance before it gives in? How about you? Do you see a BOE rate hike this year?